● ● ● ● JULY 2018 • FOODSERVICE EQUIPMENT & SUPPLIES • 77 chain profile you need a chef to do it. To bulletproof it as a concept, you need to make it as simple as possible." The first round of bulletproofing changed the kitchen dras- tically. Instead of cooking its proteins in house, I Heart Mac & Cheese turned to a broadline distributor to provide precooked, boil-in-bag proteins, including short ribs and pulled pork. This simplification allowed the company to go to an all-electric kitchen, making it an attractive investment to franchisees. "There [are] no hoods, gas lines, fryers, grease traps. It's just plug-in electric equipment, which is amazingly simple," says Collins. Since joining the company in January, Collins and his team, including new Director of Training Carol Smith, have further refined the kitchen to improve efficiency, safety and product yield. Simple Made Simpler Collins quickly noted that I Heart Mac & Cheese was "a victim of its own simplicity." The concept required little actual cooking beyond roasting the pork, with finished dishes requiring staff do little more than scoop ingredients into a bowl. This simplic- ity meant the restaurant operated smoothly enough that it was leaving some efficiency and operational gains on the table. Much of Collins' work the past few months has focused on realizing these gains, starting with its back-of-the-house kitchen. One of the most significant changes was the elimination of the chain's reach-in cooler and freezer units, replacing them with a walk-in cooler. I Heart Mac & Cheese, Collins found, simply doesn't need a freezer since staff place everything in the cooler for defrosting almost immediately after receiving items. An upright reach-in alone, however, isn't big enough to hold all the chain's product, largely due to the several pans of pasta and meats that staff prep and then store for later use, hence the adoption of a walk-in. While this adds expense, the restaurant makes up for it in operational efficiency and labor. Another change in the making has to do with how the chain performs its prep work. Until recently, I Heart Mac & Cheese made its cheese sauce in-house using a double boiler on a stock pot-sized induction burner. Now, the chain gets its cheese sauce made to spec by a food vendor. Staff also used the induction burners to boil pasta. This presented its own set of challenges. When pasta was finished to the chain's preferred al dente, staff would remove it from the pot with a strainer. Since this process took a few minutes, the noodles removed at the end were overcooked. What's more, staff weren't able to get all the noodles, leading to wasted food and higher food costs. 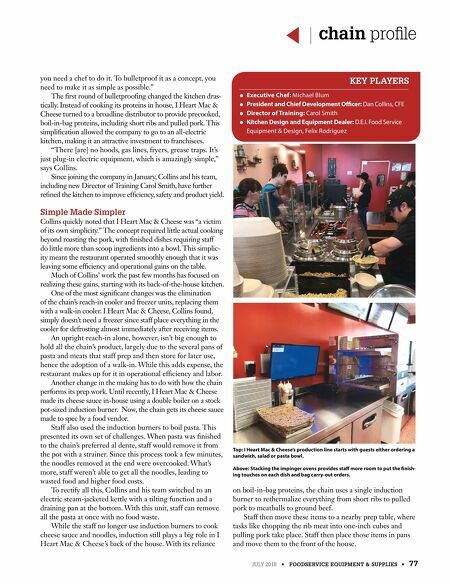 To rectify all this, Collins and his team switched to an electric steam-jacketed kettle with a tilting function and a draining pan at the bottom. With this unit, staff can remove all the pasta at once with no food waste. While the staff no longer use induction burners to cook cheese sauce and noodles, induction still plays a big role in I Heart Mac & Cheese's back of the house. With its reliance on boil-in-bag proteins, the chain uses a single induction burner to rethermalize everything from short ribs to pulled pork to meatballs to ground beef. Staff then move these items to a nearby prep table, where tasks like chopping the rib meat into one-inch cubes and pulling pork take place. Staff then place those items in pans and move them to the front of the house. ● Executive Chef: Michael Blum ● President and Chief Development Officer: Dan Collins, CFE ● Director of Training: Carol Smith ● Kitchen Design and Equipment Dealer: D.E.I. 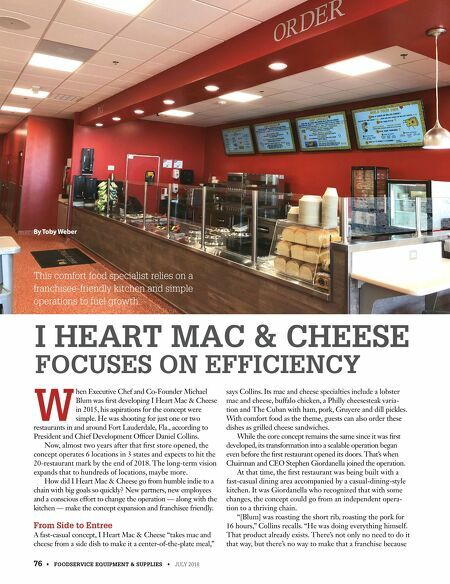 Food Service Equipment & Design, Felix Rodriguez KEY PLAYERS Top: I Heart Mac & Cheese's production line starts with guests either ordering a sandwich, salad or pasta bowl. Above: Stacking the impinger ovens provides staff more room to put the finish- ing touches on each dish and bag carry-out orders.